Madison, WI. – The second-grader, all energy and curiosity, bounded on top of the bench in the school hallway. The woman, eager to have him settle down and read a book with her, handed him a pencil, a bit of a sneaky trick. She knew from past experience that he focuses best with something to calm his hands. 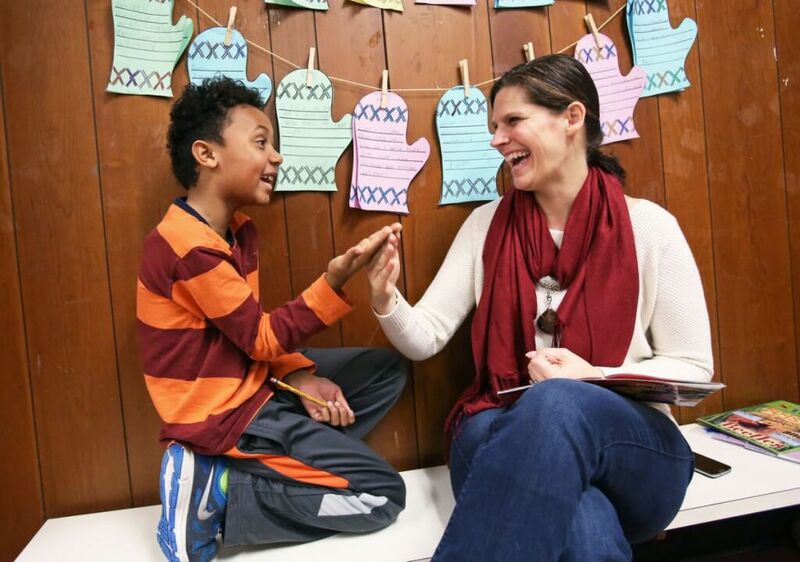 For the next 30 minutes, volunteer tutor Heather Banschbach and 7-year-old Ellis Jackson deepened their bond on a January morning at Madison’s Sandburg Elementary School. It’s the kind of relationship that has played out tens of thousands of times over many years as part of the Schools of Hope project. The effort, an unprecedented community-wide assault on the entrenched racial achievement gap, just logged its 20th year. The milestone is an opportunity, leaders say, to both reflect on what the coalition has accomplished and redouble the community’s efforts. Recent developments have galvanized people anew to address the racial achievement gap, from a jarring 2013 report called ”Race to Equity” that showed the gulf in quality of life between whites and blacks is wider here than nationally, to the current “Black Lives Matter” movement, which has called out racial inequities in numerous public institutions, including schools. The idea was unusual, maybe even unwise: Bring together people and organizations sometimes at odds with each other — the teachers union, the School Board, reporters, business leaders — and wrangle them into consensus and cooperation on challenges facing Madison public schools. The Wisconsin State Journal and WISC-TV (Ch. 3) organized the project as an experiment in “civic journalism,” in which the media not only inform the public about a problem but take an active role in seeking solutions. Carol Carstensen, president of the Madison School Board in 1995, was among many who approached the idea with wariness. She felt a previous State Journal series called City of Hope that investigated issues such as crime and housing had been too negative. Before agreeing to participate in the new venture, she met with Frank Denton, the then-editor of the State Journal. Her fears allayed, Carstensen signed on and was among local leaders who began meeting in August of 1995. In the two years that followed, their work would be informed by town hall meetings, a community survey, academic research and the investigative work of journalists. The reporting explored five school-related areas: costs; the role of families; the district’s academic achievement patterns; safety; and the impact of racial and cultural differences. It was up to the Schools of Hope leadership team to determine where to focus its efforts. The two of them led a committee that ultimately gave the group its tight focus on the racial achievement gap. United Way, with Howard at the helm, agreed to be the lead agency to pursue proposed solutions. The achievement gap had defied every other attempt to knock it back, Howard said. She and others persevered, and by 1996, the leadership team had identified eight key areas, from homework to teacher support, with lists of action items. The broadest strategies surrounded peer mentoring, reducing class sizes, and tutoring. The latter has turned out to be the most prominent and sustained element of Schools of Hope. After the State Journal issued a call for community tutors in 1998, 500 people volunteered within three days. “It was a really inspiring example of people in Madison caring about their fellow residents and wanting to be part of the solution,” said Hall, who left the State Journal in 2009 to co-found and lead the nonprofit Wisconsin Center for Investigative Journalism. Bolstered by a federal grant, the tutoring project put AmeriCorps VISTA volunteers in district schools starting in 1998 to coordinate the work of hundreds of trained community members. The ripple effects of those kinds of interactions are immeasurable, said Barbara Gerlach, an instructional coach at Sandburg Elementary who has watched the tutoring effort over its lifespan. By 2004, Schools of Hope had contributed to a highly touted victory. The percentage of black third-graders in Madison reading at the minimal level, the bottom of the state’s four scoring categories, had plummeted from 28.5 percent in 1995 to 5.1 percent. During the same period, the percentage of white third-graders scoring minimal declined from 4.1 percent to 1.8 percent. So many students had been lifted out of the basement that the racial achievement gap essentially had been eliminated in that one category at that one grade level, Schools of Hope leaders said at the time. They stressed that the gap remained in other categories and at higher grades. Since then, it’s difficult to say exactly what has happened. Comparing test scores across so many years is not possible. The “cut scores” have changed to reflect a much higher bar for students, and the assessments themselves have changed. The district’s demographics are more challenging now, too, with many more low-income students and many more students for whom English is not their native language. Still, everyone agrees that today’s scores are deeply troubling. The latest state standardized test results, released two weeks ago, show a huge gap and lots of kids in the basement. In English language arts, 58 percent of Madison’s black third-graders scored at the lowest level, now called below-basic, compared with 13 percent of white students. “I think we made pronouncements too soon that Schools of Hope was making the kind of progress we were hoping for,” said Kaleem Caire, who participated during the project’s early years, then moved away from Madison. When he returned in 2010 to become CEO of the Urban League of Greater Madison, he said he was impressed that the community’s passion around the issue had not faded, especially Howard’s. He also had a greater understanding, he said, about the limits of tutoring. Its impact pales, he said, compared to so many other factors, including effective classroom teaching, the socioeconomic status of a child’s parents, the stability of the home and a student’s peer group. “Schools of Hope has had a tremendous impact — you remove that tutoring element and the gap gets worse — but we may have overstated the significance it could have on these children,” said Caire, now founder and CEO of One City Early Learning Centers, a new effort to address the racial achievement gap. Last fall, UW researchers completed their most rigorous evaluation to date of the tutoring program. They concluded that its impact on test scores is mixed and hard to discern, but that it supports academic achievement more generally by keeping students engaged in learning. United Way’s focus also has shifted from lifting third-grade readers out of the bottom category to moving fourth-grade readers from basic to proficient in reading. This came about, in part, because United Way determined tutors could have the greatest impact on young readers who are just on the cusp of becoming proficient, as opposed to minimal readers who need more intense help from a trained teacher. United Way leaders believe progress is being made. Between 2012 and 2013, the percentage of black fourth-graders reading at the proficient level increased from 5 percent to 7 percent. “Even two percentage points of students moving from basic to proficient is, for us, a huge victory, knowing, absolutely, that we have so much more to do,” said Briony MacPhee, a United Way director who oversees academic efforts. Stanford University researcher Eric Hanushek captured the extent of the problem nationally in an article this month in the journal Education Next. He found that the black-white achievement gaps in reading and math across the country are nearly as large today as they were in 1965. If improvements continue at the same rate as seen since 1965, it will be 2½ centuries until racial achievement gaps are closed in math and over 1½ centuries for reading. Today, Schools of Hope is large and multi-pronged. The tutoring work continues — during the 2014-15 school year, 1,270 volunteer community members tutored in Madison schools — and has expanded to Sun Prairie, Middleton and Oregon. Almost all sixth-graders in the school districts of Madison, Oregon, Sun Prairie and Middleton-Cross Plains now receive free mental health screenings each year to determine if problems such as depression and anxiety are getting in the way of learning. There also are initiatives to reduce chronic absenteeism, to stem the loss in learning over the summer, to improve graduation rates and to increase the number of ninth-graders completing algebra. The total funding related to all of these Schools of Hope initiatives for the 2015-16 school year is just over $2 million, with about $600,000 of it coming from federal grants and most of the rest from United Way. A 35-member leadership team, with representatives from multiple partner agencies, oversees Schools of Hope and meets at least twice a year. Its co-chairwomen are Renee Moe, who just replaced the retiring Howard as CEO and president of United Way, and Jennifer Cheatham, Madison superintendent since 2013. Cheatham said she’d learned about Schools of Hope prior to applying for the superintendent job and that it was one of the things that attracted her to the district. In her time here so far, Cheatham said her major objective has been to strengthen the quality of classroom instruction. “By doing that, we’ve created a stronger foundation that our partners in the community can plug into for supportive initiatives,” she said, calling Schools of Hope a powerful community asset.